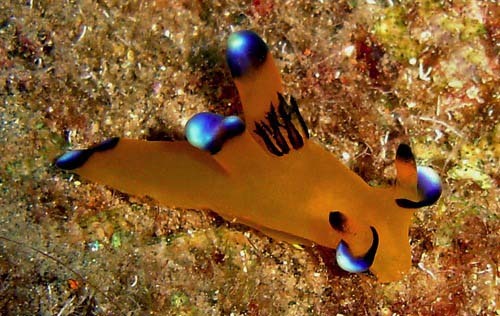 Identification: This is a translucent-orange animal decorated with black bands shading into electric-blue and white. Natural history: On Maui and Oahu, Thecacera pacifica is known from only a few animals found along the leeward coast at 8-18 m (25-60 ft). Some were crawling on sand, others on debris or Halimeda kanaloana. It has also been found in a moderately protected rocky habitat on the Kona coast of the Big Island at 3-6 m (10-20 ft). Distribution: Big Island, Maui and Oahu: widely distributed in the Indo-Pacific; also recorded from the Gulf of Mexico. Taxonomic notes: First recorded in Hawaii from Kihei, Maui by Andy Schwanke on Mar. 24, 2004. Photo: PF: St. Anthony wreck, Maui; Sept. 2, 2006.